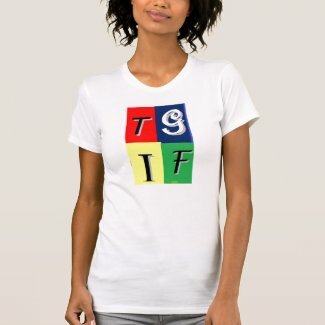 Ideas on Zazzle: TGIF What Does it Mean To You? TGIF What Does it Mean To You? TGIF can mean so much to so many. Maybe you are in the "Thank God It's Friday" camp. The end of a working week and the start of a week-end long party. Fun, Fun, Fun! Maybe you are saying "This Grandma is Fabulous!" Well here is a shirt for all you fabulous grandma's out there. And Hail to the fabulous Grandfather's too you can be TGIF too. Then there are the patriots, you want to say "Thank God I'm Free!" Isn't freedom worth celebrating? Here is the shirt for all of you. Bright, colorful, fun Celebrate TGIF everyday in every way in this T-shirt for all.